Walkthrough: Royal Avenue is home to many different shops, as well as the Battle Royal Dome. As you arrive in Royal Avenue, you will ultimately be lead to the Battle Dome. Here, you will be approached by Masked Royal, the same you will later discover is Professor Kukui. 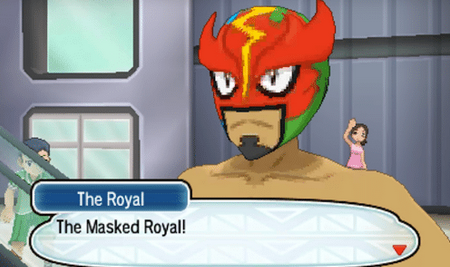 Masked Royal will suggest participating in a Battle Royal before heading off to Route 7, challenging Gladion, Hau, and yourself. Knock out any one of their Pokemon during the match to end the Battle Royal, allowing you to meet Captain Kiawe and continue your Island Challenge. There are no Wild Pokemon in Royal Avenue. Details: After defeating the Main Story, you can return to Royal Avenue to battle Captain Kiawe to a battle. You will also find the Eevee User here at the very end of the Eevee Quest.